Went to dimsum today with friends. Again to Chau Chow City, where I so loved the jasmine they serve with the meal. Turns out they sell bags of it at the cashier’s station, so I bought some. But today’s new tea is something else entirely. We walked over to C-Mart today, which is the big Chinese grocery under the parking garage that stands across the Surface Artery from the Chinatown gate. The store has gone through various name changes in the two decades I’ve been going there, but inside has not much changed. Even what’s in which aisle is essentially the same. And business was booming as is usual for a Saturday afternoon in Chinatown… or used to be. The Super 88 is closed, and so are a few of the other small groceries now, as previously mentioned in this blog. In addition to my perpetual search for more and new teas to try, I am always looking for decaffeinated options for nighttime drinking. 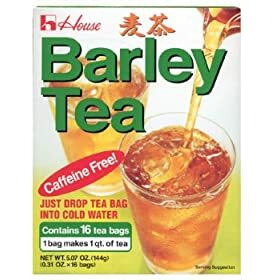 I came across a large cardboard box labeled BARLEY TEA! CAFFEINE FREE! It was two dollars. So I bought it. I’ve had barley tea in Korean restaurants quite often and always really liked it. What I didn’t realize is that it’s not tea at all, the way genmaicha is (roasted rice & popcorn tea), but it actually doesn’t have any tea in it at all. The instructions say it can be brewed hot or cold, so I brewed it hot, but I got distracted and left it a little longer than I would normally. The directions said 1-2 minutes and I left it the full two minutes. The resulting drink is much more roasted in flavor than what I’ve had in restaurants, but is quite delicious. In fact, I’d say this is what I often wish that coffee tasted like. It’s what the coffee scent–which never matches the flavor–ought to taste like. What is good about this is perhaps I have finally found a decaffeinated beverage that corwin will also like. He doesn’t like fruity teas at all and really didn’t like either honeybush or rooibos. But I bet he will like this. Another plus for the distracted multi-tasker that I am, it is good after it’s gone cold, too. Now I wonder if it goes through multiple steeps?